Home » Intermediate » Music Business Made Easy! If you’re trying to make it in the new world order of independent music, this is the music business book for you. I’ve used Ari’s information before on SongChops and tweeted out his gig advice on several occasions, but there’s nothing better than the manual! 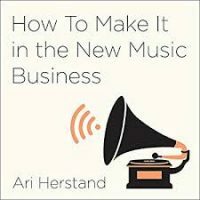 Ari Herstand’s How To Make It In The New Music Business not only has inspiring stories, but it’s a solid business book whether you’ve been gigging for a while or just starting out. Wondering how social media can work for you? How to build a band of followers and fans so you can make a living and reassure your parents that you won’t end up at the soup kitchen by the time you’re 50?! This book is about the passion of having to be a musician, and how to turn it into a livelihood – without waiting on the silver bullet of a record company deal. While you might just be inventory to them, your belief in yourself can create a pretty strong self-sustaining business. Ari outlines it and gives you steps to make it happen – GET IT NOW!.